Well, we certainly weren’t going to let that happen again. Unfortunately, last year, one of the two cherry trees bit the dust. Whether it was lingering effects from the drought a few years back, disease, or that it was just its time, we had to take the old boy down, leaving one very misshapen tree. Enter Christine the Pie Queen, her husband Jeff (whom you know from the “dinner of the month” guest column series), and a couple of their friends from Wisconsin – who just happened to own an orchard. The orchard owners agreed to come over last winter and do some tree surgery, pruning the remaining tree into a shape where it might have a change for survival. We held our breath and waited for spring. The tree apparently survived and enjoyed its “haircut” – this year, the tree was not only extremely healthy, but produced an embarrassment of riches cherry-wise. We gave quarts and quarts away, but not before keeping enough to do another cherry dinner with Jeff & Christine. We started with Jeff’s ”cherry cocktails.” We were a bit skeptical at first, but this mélange of citrus vodka and cava, garnished with bourbon-soaked cherries was also delightfully refreshing. This was served with an amuse-bouche of pesto-stuffed mushrooms. (Yeah, one dish without cherries…so it goes.) We lingered over these tasties for awhile before heading to the dinner table. The Sweet Partner in Crime followed up with a fresh arugula salad with apples, toasted walnuts, goat cheese and dried cherries. We opened a bottle of Villa Maria 2008 Riesling from New Zealand to go alongside. The Riesling brought a little sweetness to set off the bitterness of the greens and the tartness of the cherries. Needless to say…yum. We took a pause here for a palate cleanser. Christine had done a tart cherry granita, a wonderfully refreshing little palate awakener – and perfect for an evening with temperatures in the nineties. The entrée – well, there are few things in the world that go better with cherries than duck, so we decided to prepare a quacking good course. Duck breasts with shallot and dried cherry sauce over saffron rice pilaf. We paired this with the Casa Marin 2006 Litoral Vineyard Pinot Noir. Considering the noises of sheer yummitude coming from around the table, I think the whole shebang ended up tasting pretty good. As a general rule, almost any kind of food that incorporates cherry flavors will be good with pinot noir, especially good pinot noir. Finally, whatever sacrifices Christine made to the Pie Goddess were obviously warmly accepted, because the confection she put together was one of her best. Cherry pie. Plain and simple. And just about perfect. Alongside, a delectable dessert wine: Dashe 2007 Late Harvest Zinfandel. Neither pie nor wine lasted very long, and I opened a Frangipani 2004 Late Harvest Zinfandel to finish off the evening. It was good, but it wasn’t nearly as tasty as the Dashe. Still, by that point in the evening, going with something that didn’t require too much thought (considering our collective level of cognitive function by this point) was probably the best strategic move. Some of you may remember the piece I wrote a bit ago about the wines of adult film actress Savanna Samson. Savanna was goodly enough to give me a chance to interview her. I didn't, however, find her wines particularly good -- which put me at odds with Robert Parker. Parker's 90+ score on her first wine gave her instant street cred in the wine world. In any case, one of the first names in the article is Daniel Oliveros, which sounded very familiar to me for some reason. I should have known it immediately -- but that's Savanna Samson's husband (her married name is Natalie Oliveros), and this little conspiratorial exercise in selling fake wine involved not only Oliveros, but Parker as well. I don't want to cast too many aspersions here -- and I don't want to engage to fully in the sort of guilt-by-association stuff that so many other folks use as "journalism," but I've learned enough to know that the world of high wine Illuminati is a very small one. Savanna's wine was an Italian red. According to her, Parker was tasting Chateauneuf-de-Pape at the time and happened to agree to give Savanna's wine a taste while he was in the midst of going through that spread. It seems quite the lucky coincidence that Savanna a) was able to squeeze her wine into this tasting, even though it was unrelated and b) that she just happened to be in the same place to garner such high praise from Parker. I've got no problem with someone using his or her connections. This is a world of shameless self-promotion, after all -- but, at least in my mind, this calls into question a lot of the "objectivity" of the folks who move the wine world with a swirl of a glass. 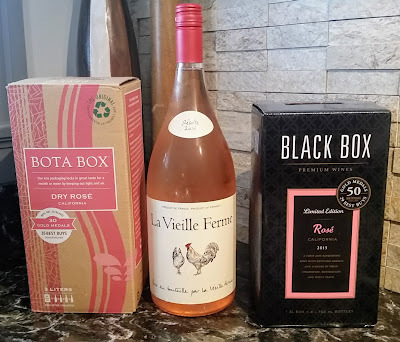 I’ve written a couple of times before about box wines. Many of them are excellent values for everyday drinking. The only drawback to them is that they tend to be…well…boxy. The usual size of these is three liters, which is the equivalent of four bottles. The packaging is ingenious, since it’s basically airtight and wines will last a long time, especially while refrigerated. One drawback, however -- while that size is handy to have around the house, it’s not particularly portable. Smaller versions have been popping up in some stores. J-Mac (not to be confused with J-Woww), one of the Vine’s regular readers, suggested: “It's summer, buy a couple of those "juice boxes," and have a picnic…” Not a bad idea! The smaller versions come most frequently in one-liter containers, so there's an extra glass or so per carton compared to a regular bottle. You also can find them in 500 ml or 250 ml sizes, so they do start to approach the size of a Capri Sun. If you've got kids and you buy some of these, make sure you check closely when packing lunch. I’m not sure how well pinot grigio pairs with 4th grade civics. These packages are also considerably lighter than glass bottles, so they make much more sense when you’re heading out to the local park, woods, levee, or anywhere else you may want to spread a blanket and enjoy some good company. In Europe, winemakers have been putting out this kind of smaller packaging for years, but it’s yet to catch on in the U.S. (although I think that will probably change in the future). Three Thieves "Bandit" 2008 California Pinot Grigio -- not half bad. Pleasantly peachy nose. Fairly substantial for a pinot grigio. Some weight to the palate with apple and peach flavors. A little bit of residual sugar, clearly. The finish is fruity and slightly sweet. It's not as acidic or tart as many pinot grigios, but I don't think that's the idea here. The purpose is clearly to create a wine that is food-friendly and inoffensive. Success recorded. For $5-8 a liter, an excellent value, especially when you're comparing it to other bottles of pinot grigio in the $4-6 range. It blows those away. Vendange "Tetra Pak" (NV) California Chardonnay -- There's a saying I've heard somewhere in my travels: "A little bit of sugar covers a whole lot of flaws." This Vendange is a lovely illustration of just that. Since it's inexpensive California chardonnay, I expected either a load of oak or cream, with some fruit. I was one for three. Very little, if any, oak. No butter. Some pear flavors, but the nose is odd, and there's a residual sweetness that's probably there to cover the fact that, well, not a lot of care went into the making of this wine. It's leftover juice, fermented, sweetened a bit, and packed up to sell at about six bucks a liter. After a glass, my stomach hurt a bit. Give it a pass unless you're making spritzers. French Rabbit 2004 Vin de Pays d'Oc Pinot Noir -- I'll admit I was looking forward to a portable pinot. I didn't have high expectations, of course. I just hoped for a light, food-friendly red that I'd be able to put a little bit of a chill on and slug on. Cracked it, poured it...and almost spit my mouthful across the monitor. This was an absolutely horrible wine. The whole point of having one of these "tetra paks" is that a wine is supposed to stay fresh. If this was "fresh" wine, I don't know who'd like it. Sour, acidic, and horrifically unpleasant. My immediate thought was to take your $8-9 and buy yourself a sixer of Smithwick's or something. You'll be better off. Bleah. Something nagged at me, though. The Vendange and the French Rabbit seemed so “off” that I couldn’t believe a winery would actually send those out into the world. I was at my local Kroger and decided to pop into their wine store. They had the Vendange, but not the French Rabbit. Instead, I picked up the Alice White (NV) South Eastern Australian Shiraz. The Alice White was, for all intents and purposes, the same as the Alice White that you’d get in a bottle. Straightforward, fruity, drinkable, and non-thinkable. Decent enough if no one’s looking. But my second go-round with the Vendange was a different experience. There was less sweetness and none of the weird nose. It still wasn’t my favorite chardonnay – even at that price point – but it was much more palatable. So, what happened? My theory – the inexpensive wines are the ones handled with the least care. At some point along the line, these containers were probably left to sit in a hot truck or on a hot palette somewhere – and the wine began to turn to vinegar. In the French Rabbit’s case, that process was rather far along, I think. I won’t name names, but I’ve had “vinegarized” box wine on a couple of other occasions from this same beverage superstore. I would be willing to give the French Rabbit another try, but I haven’t been able to locate it anywhere else around here. I’ll update this entry when I get the chance to give it another go. Just the same, like many of the inexpensive wines out there, as long as you don’t need to think too much about what you’re drinking, you can probably find something at least decently quaffable to pack along in a cooler or a basket. No breakage, no worries, and easy cleanup. Any of you have experience with these you’d like to share?